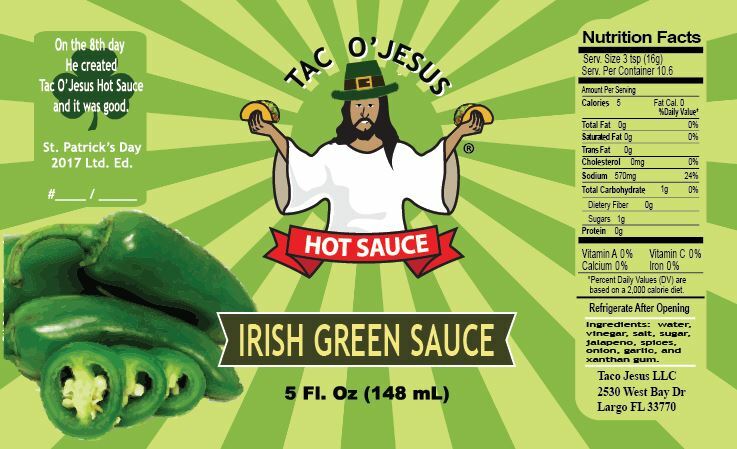 FLASHBACK: A couple of years ago we released a limited edition sauce for St. Patrick’s Day 2017. While it’s too late to get your hands on the sauce with this label you can still get our awesome Salsa Verde sauce with the standard label. This terrific sauce has a great mild flavor and picked up two awards in the 9th Annual Hot Pepper Awards for BEST MILD SAUCE and for BEST SAVORY SAUCE. 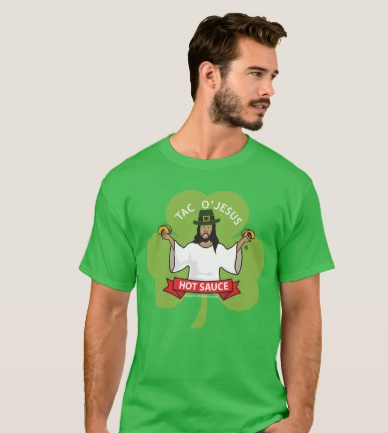 And if you are in need of some Tac O’Jesus merch you can pick on one of these outstanding t-shirts over in our apparel shop and be the coolest cat at your St. Patrick’s day shindig. Thank you to all of you disciples out there who are continuing to spread the Taco Gospel. Be sure to follow us on Facebook, Instagram, Twitter or Tumblr to keep up with our latest adventures and to find out where you can see us next and buy our products. Come out and see us the fist Saturday in 2018 (January 6th) at the St. Pete Indie Market at Green Bench Brewing Co. in St. Petersburg. We always have a great time at this event and we look forward to seeing you there. Besides our awesome sauces there will be a ton of other great vendors with all kinds of great merchandise, plus some tasty locally brewed beer and good food from Red Mesa Mercado. 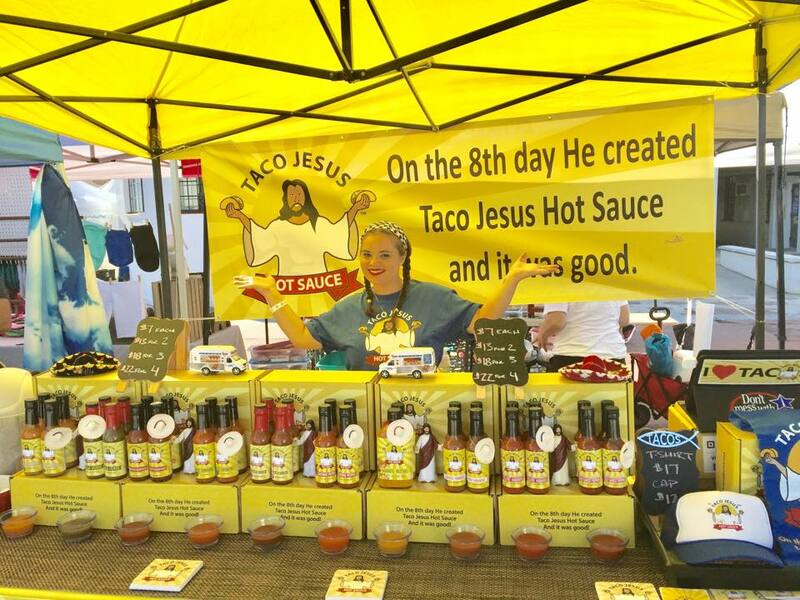 ‘Tis the season to spread the Taco Gospel and give the gift of Taco Jesus Hot Sauce. You’ve got a ton of great options for purchasing our sauces for your friends and family stocking stuffers. In Florida you can get our sauces at the Belleair Market in Belleair Bluffs, at Bauser’s Full Liquor Bar in Dunedin or at Cooter’s Restaurant and Bar on Clearwater Beach. In California you will find us at the James Sierra Gateway stores in South Lake and Kernsville and at the Isabella Supermarket in Lake Isabella. In other parts of the country you can order online from the Taco Jesus online store to get some extra added Taco Jesus swag. And if you use code 30FREE at checkout you will get free shipping on any purchase of $30 or more. You can also get select sauces at Amazon.com. No matter how you pick up your Taco Jesus Hot Sauce we know your friends and family will be thrilled with the gift, and we will be forever grateful that you have continued to support us as we work to spread the Taco Gospel. May you all have a blessed holiday season. Here at Taco Jesus Hot Sauce we love being based in the Sunshine State, but the laid back lifestyle draws some folks to the state who … lets just say aren’t the sharpest tools in the shed. These are tales of those people, taco related tales. This first story comes from right down the road from our corporate office in Largo, FL. Sometimes you get the muchies real bad and only Taco Bell will satisfy that craving. Come out and see us this weekend at the Pierce Street Market on the waterfront in downtown Clearwater, FL for your chance to sample all of our sauces and pick up some great deals for the spicy food lover in your life. There will be a ton of great local vendors and food trucks at this beautiful venue. If you have never been out to the market you owe it to yourself to get out this weekend and take advantage of our awesome Florida weather to help support local small business owners. Tampa Bay’s own The Eat Up Show recently featured Taco Jesus’ Garlic Habanero as part of their Valentine’s Day recipe. Chef Don Stugots guarantees you’ll get lucky if you follow this simple recipe and serve it to your significant other this coming Valentine’s Day. Check out The Eat Up Show on Facebook and watch the clip below. 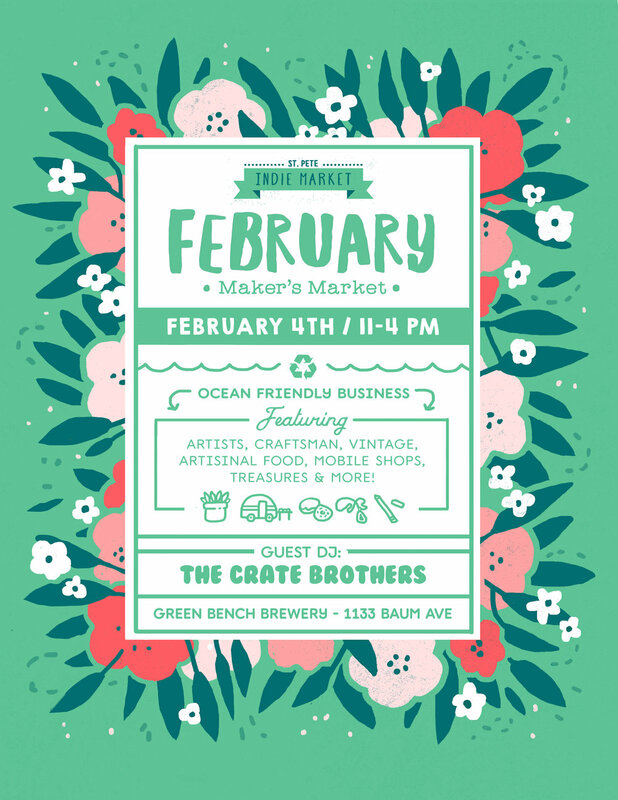 Come out and see us Saturday February the 4th in St. Petersburg, FL at the St. Pete Indie Market at Green Bench Brewing and pick up some awesome local products, try some great craft beers and get your Taco Jesus Hot Sauces. We’re excited to be back in St. Pete for this awesome event.